WASHINGTON — The shooting at a baseball practice of Republican Majority Whip Steve Scalise (R-LA) and others is the latest incident to put Congressional security in the spotlight. 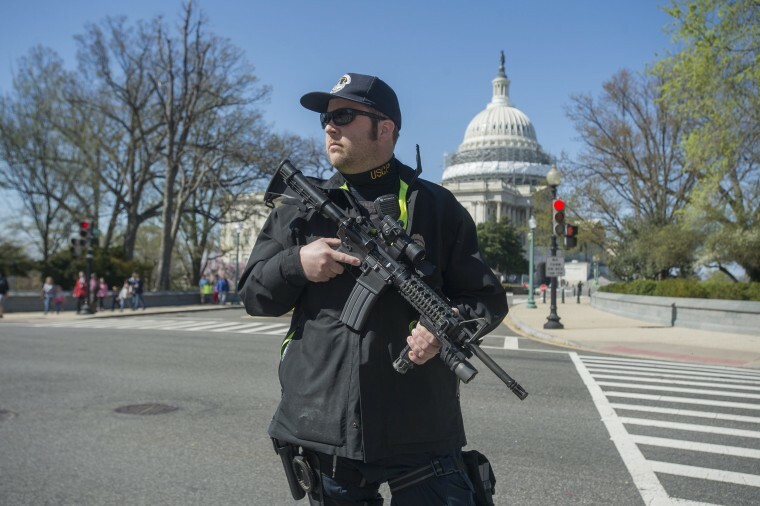 The U.S. Capitol Police — one of its officers was also shot Wednesday — have expanded their footprint over the years in response to prior incidents, but are primarily tasked with guarding the Capitol grounds and investigating threats against lawmakers. Outside Washington, members coordinate events with local and state police and sometimes use their own personal security. The Capitol Police has over 2,100 officers and civilian staff, according to its website. Only a small number of members in leadership positions receive full-time protective details from the Capitol Police, including the House Speaker, House and Senate Majority and Minority Leader, and House and Senate whips. Rank-and-file members sometimes receive added protection in response to specific concerns. Lawmakers credited leadership’s mandatory protection with preventing a far worse tragedy on Wednesday, saying the event may have been undefended without Scalise, the third-ranking Republican in the House, attending with Capitol police officers. “He probably saved everybody else's life because if you don't have a leadership person there, there would have been no security there,” Sen. Rand Paul (R-KY), who was at the baseball practice, said on MSNBC’s Morning Joe. “We all would have been vulnerable without return fire,” Rep. Brad Wenstrup (R-OH) told NBC News. The protective details were expanded in 1998 as part of a series of measures responding to the fatal shooting of two U.S. Capitol Police officers, Jacob J. Chestnut and John Gibson. One former leadership aide recalled to NBC News that the quickest way to find their boss at any given moment was to contact their security. The 1998 attack by a lone gunman also prompted the construction of the Capitol Visitor Center in order to serve as an additional checkpoint between tourists and the main building. The most serious incident attack against a member and staffers occurred In 2011, when then-Rep. Gabby Giffords (D-AZ) was shot at a constituent event in Arizona along with eighteen others, six fatally. Giffords, who survived, is now a prominent advocate for gun safety laws. A former House Democratic aide said their office had since been trained by the Capitol Police in active shooter situations: After a 2013 incident in which officers fired shots at a car that crashed at a security barrier nearby after a chase, killing the driver, staff huddled into a room away from windows in line with their prearranged plan. There have been other incidents around the Capitol since then. Last year, a man known for shouting religious slogans around the Capitol was shot and arrested after pulling out a BB gun at the Capitol Visitor Center. Members have raised concerns about security in recent months. Some Republican members suggested they needed to review their protection after a series of crowded, sometimes heated, town halls. The FBI arrested a man in May for leaving threatening voicemail messages for Rep. Martha McSally (R-AZ). Individual lawmakers have also reported death threats to the Capitol Police, including Rep. Al Green (D-TX), who said he received violent racist messages after calling for President Trump’s impeachment. Emerging from a House meeting on the shooting on Wednesday, Green told NBC News his top priority was addressing security for to protect Congressional staff outside the Capitol. One Congressional staffer, legislative correspondent Zachary Barth who serves in Rep. Roger Williams' office (R-TX), was wounded in Wednesday's shooting. "In our district offices, most of them, there is no police protection available to the extent that we have it here," Green said. "We got to look out for our staff." Rep. Ruben Gallego (D-AZ) brought up a number security issues after the meeting as well, including the possibility of using campaign funds to pay for security at their homes. "Everyone is getting a bunch of death threats right now," Gallego said. Capitol Police chief Matthew R. Verderosa testified at a House Appropriations hearing in February that officers were taking into account “a rise in terrorist organizations attacking public venues” as well as “increased occurrences of homegrown violent extremist ‘lone wolf’ episodes” as part of their duties. CORRECTION: (June 14, 2017, 1:12 p.m): An earlier version of this article misstated Texas Rep. Al Green's political affiliation. He is a Democrat, not a Republican. CORRECTION: (June 14, 2017: 2:16 p.m.): An earlier version of this article misstated the party affiliation of former Rep. Gabrielle Giffords. She is a Democrat, not a Republican.